The year 2014 marks the 40th anniversary of the introduction of Cargotec’s Siwertell screw-type unloaders to the dry bulk handling market; today Siwertell, part of Cargotec, continues to lead the way in clean, efficient, environmentally friendly unloaders and loaders of all sizes. Forty years since Siwertell entered the marine dry bulk handling market, the Cargotec brand remains perfectly placed to respond to industry demands for high capacity machines endowed with exemplary environmental credentials, says Per Karlsson, Managing Director, Siwertell. He cites the 2013 Review of Maritime Transport from the United Nations Conference on Trade and Development (UNCTAD) to demonstrate the market’s current need for ever more efficient, clean, high capacity dry bulk handling technology. Demand is mostly driven by Asia, and in particular China. However, the UNCTAD review also found that Indonesia, for example, is emerging as an important player with respect to commodities such as coal, bauxite and metals. Coal remains the fastest-growing fossil fuel, accounting for 30% of global primary energy consumption in 2012. “Growth in the various markets and ever stricter environmental rule-making increase the demand for advanced bulk handling systems, at the expense of more traditional systems that cannot offer clean operations,” notes Karlsson. “From the outset, due to its totally enclosed design, the Siwertell screw- type unloader has provided clean, dust and spillage free performance. A modern Siwertell ship unloader may not look very different to its predecessors; testament to the excellence of the overall concept and the initial design work. However, a lot of functional developments have been incorporated over the years, particularly relating to control and maintenance systems, which have undergone a revolution during the last decade, with further substantial developments expected. “We have always been quick to respond to new market opportunities; and we have also been pro-active in developing products to meet anticipated demands,” he says.“This is well demonstrated by the recent introduction of our largest unloader, which can handle some bulk commodities at capacities of up to 5,000tph [tonnes per hour]; more than doubling current capabilities.” Karlsson says that Siwertell’s screw-type unloaders were introduced to the market at a propitious time. In the mid-1970s, port operators were coming under increasing scrutiny regarding dust emissions and noise levels as a result growing residential occupancy of desirable waterfront locations. The Siwertell screw-type unloader came into its own, delivering quiet, dust-free bulk conveying; allowing commercial and residential communities to co-exist successfully. Siwertell was the first company to enter the cement and coal handling industries with a screw- type unloader. Prior to this, these two materials had only been handled by grab cranes and pneumatic systems. An important factor in this success is the screw conveyor’s unique, patented inlet feeder, designed and developed by the two Swedish inventors, Olle Siwersson and Gunnar Tell, who combined their surnames to give the brand its famous name. By counter-rotating the inlet device the amount of material that could be transported in a vertical conveyor increased from about 20 per cent to about 80 per cent of the tube’s internal volume, by preventing material from being thrown out of the screw during feeding, which massively improved the unit’s efficiency. The counter-rotating inlet device has other important functions including digging and loosening packed material in the ship’s hold; gathering material from the hold and feeding it into the screw; and minimizing dust creation by taking material from below the cargo surface. 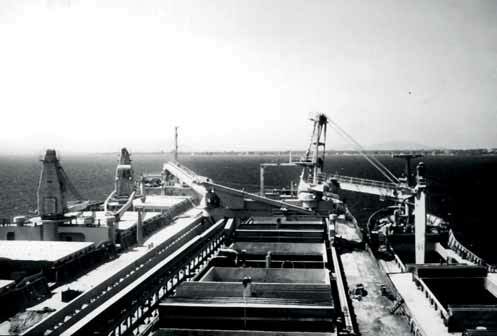 Although initial development work was aimed at the land based agricultural market, the potential for ship unloading applications was quickly recognized. Loading systems, road mobile unloaders and full terminal systems followed, all bearing the Siwertell hallmarks of efficiency, reliability, high capacity and minimal environmental impact. Siwertell will shortly deliver the third road-mobile 10 000 S cement unloader to the Turkish construction services company, Mussa Insaat Dis Ticaret Ltd of Istanbul. The trailer-based, diesel-powered unit will have a rated discharge capacity of 300tph and will be equipped with a dual bellows system and dust filter. The units will work at several sites along the Libyan coast, helping to meet the cement demands for the country’s extensive rebuilding programmes. “Siwertell mobile unloaders are ideal in these circumstances, because they have the flexibility to unload cement at the most convenient port for the work in hand, cutting road transportation to a minimum,” notes Karlsson.